This past weekend I headed to the Litchfield Hills on the hunt for great shops, art galleries, and lunch. My partner in crime, a friend who knows the area well, and she has fabulous taste, lead the way. The ride through the winding back roads with endless pastures and beautiful homes was inspirational without even getting out of the car. Ham, french mustard, tomme de savoie cheese and beschamel sauce on Berkshire Mountain Bakery’s San Francisco Sourdough bread served with field greens and local Adamah Dilly Beans. 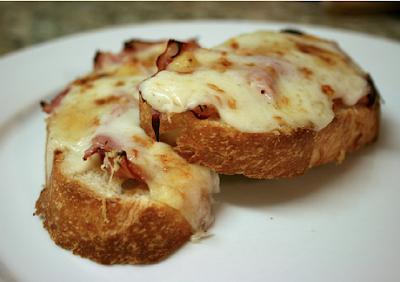 This is a simply grilled ham and cheese on crusty french bread topped with beschamel sauce. I opted for topping it with a fried egg...it was every bit as good as I had been dreaming. I am off to the kitchen to make them for supper. Candle Light is optional. Recipe will follow.